1 professor ＋ 10 students who came from Kyoto stayed tonight. They belong to same university seminar class. They look very close,and I was glad to feel the friendship and the feeling between a master and an apprentice. To the nice teacher and the nice youths!Cheers!! Each of the students will make a new start from April as a member of society. I'm looking forward to seeing them next time,maybe on a precious vacation. We have closed to accept the application for the event . 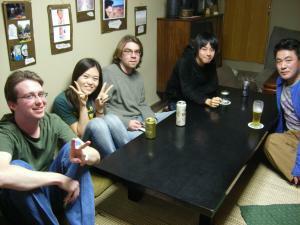 We organized the English speaking event in Kaine,which participants enjoy English speaking with drinking . In Fukuoka, there are many people who are seeking the occasion to use English . Yesterday ,5 of participants came to the Kaine and enjoyed English speaking with others and guests who stayed in the Kaine . It was so exciting and fun ! I think that it's not so easy in Japanese that we communicate with different generation friendly, cos we care many things like our way to talk is polite or not . But it's possible in English,or maybe with some other language . People need a communication for now. 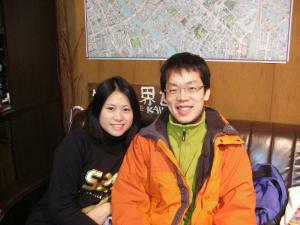 Let's talk in English at the community room of Guesthouse Kaine! It doesn't matter whether you can speak English or not . We will also accept any requests about the contents. Hello! It's warm today and yesterday. I'm extremely sensitive to cold, but I'm wearing only 4 clothes the two days (how many clothes do I wear everyday!?). In this weather, some blossoms will open up earlier than normal season at Dazaifu shrine. But it will be cold on this weekend. Please take care not to catch a cold! 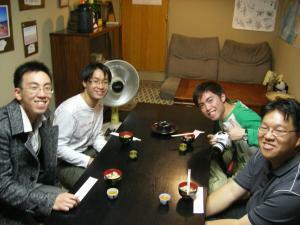 Last weekend, lots of guest stayed at Kaine who are Moo-san's friends. 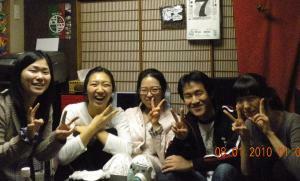 They took a trip to Fukuoka as women's neighborhood association. This photo,they　grab a drink before they go out to downtown. Franky he stayed at Kaine from year's end to new year gave us this calendar. 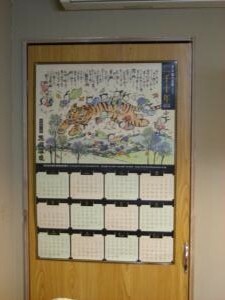 It's Kurokawa hot spring's calendar. We are so grateful, Franky!